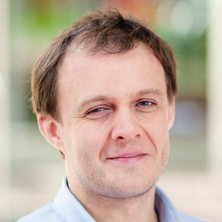 Dmitry Ovchinnikov is currently a scientific director and general manager of the NCRIS/BPA-funded stem cell functional genomics facility, StemCore, and a Research Fellow in the Stem Cell Engineering Group at the Australian Institute for Bioengineering and Nanotechnology at the University of Queensland. His main research interests lie in the genetic manipulation of pluripotent stem cells for investigations into the stem cell biology and mechanisms of neurodegenerative diseases, e.g. Down's syndrome and Alzheimer's disease. He is utilizing both gene knockdown and overexpression approaches to dissect the roles of various signalling pathways and specific genes in the aetiologies of these conditions. His research interests include the generation of transgenic ESC and iPSC research tools for bioengineering applications, re-programming somatic cells to pluripotency (iPSC generation), seamless (traceless) correction of the disease-causing mutations, and other precise modifications of the human genome. More recently, he has also developed an interest in the transcriptomics and epigenetics of pluripotent cells, their derivatives and cancer cells. Previously, he led the Transgenic subgroup in the laboratory of Professor David Hume at UQ’s Institute for Molecular Biosciences, where he generated a number of transgenic mouse lines, some of which are widely used for investigations into macrophage function, and other in vivo studies. Dmitry received his Diploma in Biochemistry (Masters equivalent) from the Lomonosov Moscow State University in 1993. He completed his PhD studies in the laboratory of Professor Richard R. Behringer at the University of Texas MD Anderson Cancer Center, where he was involved in the development of transgenic resources and performed some of the first studies in mice utilising the conditional knockout-enabling Cre/loxP system. My research interests revolve around genetic and epigenetic regulation of normal pluripotent stem cell maintenance and differentiation as well as mechanisms of development and progression of human genetically-based diseases (syndromes) and cancer. In particular, I have been involved in development of numerous transgenic human ES/iPS tools facilitating studies of both maintenance of pluripotency and directed differentiation, with particular focus on neural and cardiac cell development. I'm also creating platform technologies allowing for both up- and down-modulation of the function of single and groups of genes. Those include inducible gene overexpression systems and regulatable system for generation of pre-determined genomic alterations in pluripotent stem cells. Harnessing novel modifications of the CRISPR/Cas9 technologies to interrogate the living cell. Fine-tuning gene expression to improve understanding of the biology of human pluripoten stem cells and their derivatives. Novel mechanisms of intercellular communications in human pluripotent stem cells. Varga, E. V., Cherenmova, O. A., Ovchinnikov, D. A., Shapiguzov, A. Yu, Kudryavtseva, E. I., Morozova, O. V., Engelhardt, N. V. and Lazarevich, N. L. (2001) Expression of tissue-specific genes with progression of mouse hepatocellular carcinoma. Genetika, 37 6: 803-810. Chen, H, Dryer, S, Cygan, J, Lun, Y, Ovchinnikov, D, Gan, L, McMahon, AP, Lee, B and Johnson, RL (1998). Limb phenotypes of lmx1b mutations in mice and man. In: Developmental Biology. , , (163-163). . Targeted disruption of lmx1b reveals its multiple functions in limb and mid-hindbrain development. Chen, HX, Lun, Y, Ovchinnikov, D, Gan, L, Golden, JA and Johnson, RL (1998). Targeted disruption of lmx1b reveals its multiple functions in limb and mid-hindbrain development.. In: Developmental Biology. , , (185-185). .
Genomic engineering of human pluripotent stem cells.